LittleDuffer™ Mini Golf, launched as a low cost indoor or outdoor modular miniature golf course in 2012, has been upgraded to increase fun and make it easier for special events and rental operations. “We continue to receive customer input for more portability and flexibility in the course layout, for their operations”, announces Scott Lundmark, president, Adventure Golf Services (“AGS”). “By borrowing some of the concepts from our SplitShot© miniature golf course, we have been able to provide smaller fairways and greens linked together with bridges. This concept is more fun and replaces the earlier model. “There are a multitude of ways to attach the fairways and multiple greens, which provides the owner with easier set up and more options to setup around existing barriers. 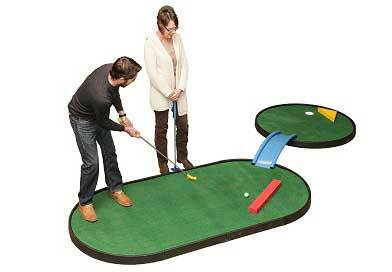 LittleDuffer™ Mini Golf has nine or 18-hole package prices or an owner can buy as many individual golf holes as needed. The fairways, greens, bridges and rubber obstacles can also be purchased separately”. The price for a nine-hole course is $11,505 and requires a recommended minimum space of 1,500 square feet. A variety of obstacles are available for an additional cost. “We continue to sell the LittleDuffer™ Mini Golf to campgrounds, hotels / resorts and other venues but the new model is specifically designed for easy use and storage for special events, fund raisers and rental companies,” states Lundmark. “The interlocking panel system makes this portability possible. Unlike other courses where each golf hole is one integral piece, with this course each green is made from four pieces and each fairway eight pieces which can be quickly assembled, and placed where desired. When disassembled, the LittleDuffer can be loaded into any type of container for easy transportation and storage. All putting turfs are precision cut and lay on top of the completed sections,” concludes Lundmark. Adventure Golf Services is a global leader in the design, building and installation of indoor / outdoor miniature golf and other golf related, special application products. AGS offers the world’s largest selection of modular and portable miniature golf products at price points for all budgets and course sizes for all spaces / venues. For more information, please visit our website: www.adventureandfun.com or call 888-725-4fun or 231-922-8166.